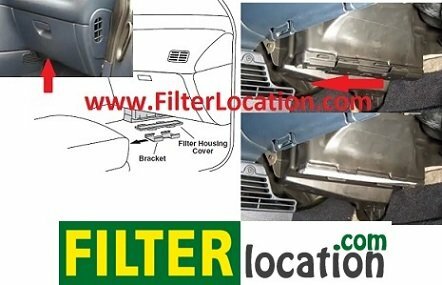 Here you can find how to locate Chrysler Voyager pollen filter when you need to replace. Where is located cabin air filter on a Chrysler Voyager. Maintenance of a car differ from a vehicle to another. If you car service is approaches, below you can see how to change air conditioning filter. Cabin air filter on Chrysler Voyager is located inside the car on the passenger side. To have access and to replace the cabin air filter on a Chrysler Voyager follow the next instruction. On the passenger side look under the glove compartment. Look under the glovebox to locate sliding bracket and filter housing cover – see picture. Slide bracket in front to the seat to remove bracket and housing cover. Take filter out by pulling down and bend at folding point to remove – see up picture. Insert new Chrysler Voyager cabin air filter with the arrow pointing to the front of vehicle (- see picture -) and reassemble housing cover and bracket. For more guidance feel free to ask about how to replace the air conditioning filter for Chrysler Voyager. If you want to reset service light reminder on Chrysler Voyager click here. 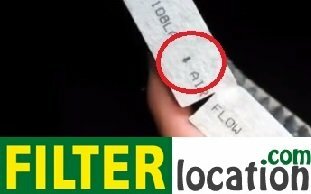 How to locate if you need to change cabin air filter, oil filter, fuel filter, pollen filter, dust filter or air filter on Chrysler Voyager.